Don’t Miss These Limited Edition Designs! Annalee designs are made to be different. Since the very beginning when Annalee Thorndike started making her creations in an old chicken coop, the goal was always to make something unique and infuse it with a little bit of magic. Annalee wanted to make people smile and her designs were not shy of fun, mischievousness, and whimsy. Fast forward more than 80 years, and this mission is as strong as ever. Every season the Annalee team is proud to introduce unique, lovable, and emotive decorations and gifts. The NEW Limited Edition exclusive designs for Fall and Halloween are outstanding examples! How do we come up with Limited Edition designs? All our NEW designs come from the creative forces at Annalee Headquarters in one way or another. Sometimes there are contests or suggestions taken from fans, but, ultimately, each final creation comes from the efforts of our dedicated designers. Our design team debates the smallest and the biggest details from size to style to theme. There is always a lot of debate in the workshop about perfecting the details for accessories, facial expressions, or fabrics. While we offer a new line of designs every season, we curate a special collection of limited editions for our core collectors. Are you familiar with the Assembled in America Collection? The exclusive designs in this collection are made in extremely limited quantities. Each are numbered and signed by the assembler for authenticity. 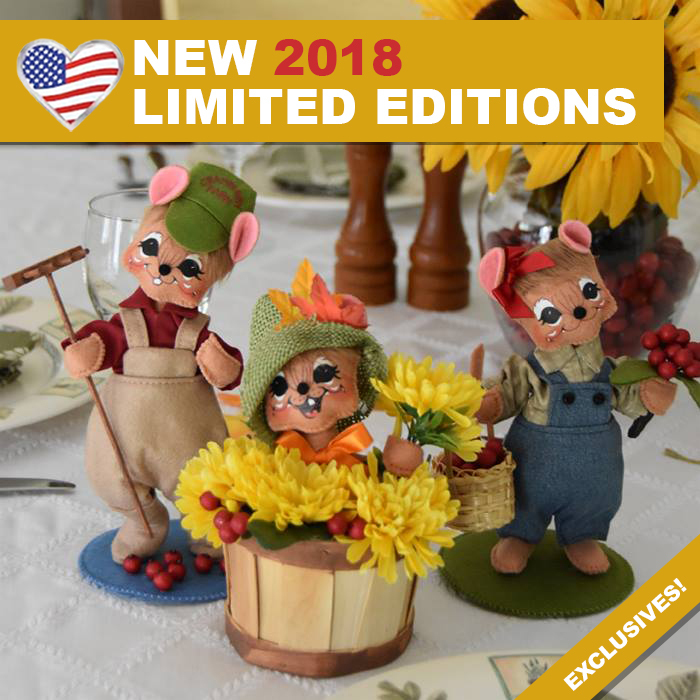 So without further ado, here are the NEW Limited Editions for Fall 2018. Don’t miss the chance to have one of these exclusive designs in your collection. Limited Editions – only 250 of each design will be made! Introducing our first-ever cranberry-themed designs! This precious amber mouse couple is ready for the cranberry harvest. Decorate with this sweet set from September through November! Place this wreath on your door to greet your guests with an Annalee smile this autumn! The cheerful 12-inch harvest elf stands playfully in the center of the grapevine wreath decorated with silk leaves, mums, berries, and pinecones. Here’s a stunning centerpiece for your table this autumn. The sweet amber mouse wears a moss green burlap hat with leaf accents and peeks out from a bushel basket of mums! It has a orange satin bow at the neck. Your costumed guests will love this Halloween treat bowl! These gray mice dressed as bats are guarding the candy to make sure the trick or treaters take just one! Candy bowl is made of felt and measures approximately 6 inches in diameter. Depicting the classic spooky folklore, this Headless Horseman holds a jack-o-lantern in one hand as his horse rears in the air! Your Halloween collection isn’t complete without this design. It’s sure to go fast. Don’t miss out! Make a statement this Halloween with “Agnes the Hag” witch! Her intricate witch’s outfit will wow your guests. Agnes has crazy gray hair and a crooked nose (with a wart). Her look is completed with a book of spells and a classic witch’s broom. What’s more purr-fect for a spook-tacular October? This black scaredy cat is the perfect addition to your Halloween collection! It wears a witch hat and holds a pumpkin with bat accents. “Boo!! !” This Halloween ghost is more sweet than spooky! It wears a purple top hat and has an orange bow at the neck. A fun and ghostly addition to any Halloween Collection. These sweet little Halloween friends are all dressed up to go trick or treating! They’ll look great set up next to your candy bowl this October! Limited Edition – only 250 sets will be made! Presenting an Exclusive Nativity Series! This 5-piece set is made up of sweet children dressed as Mary with Baby Jesus, Joseph, a shepherd, a lamb, and a donkey—about to put on their own Christmas pageant. Don’t miss out on this precious Christmas series! The standing figures measure approximately 5-inches tall. PLEASE NOTE: This design will be back in stock in September! Join our waitlist to make sure you are among the first to know when it’s available again. Are You A Limited Edition Collector? Don’t miss out on these new designs! They won’t be available for long.